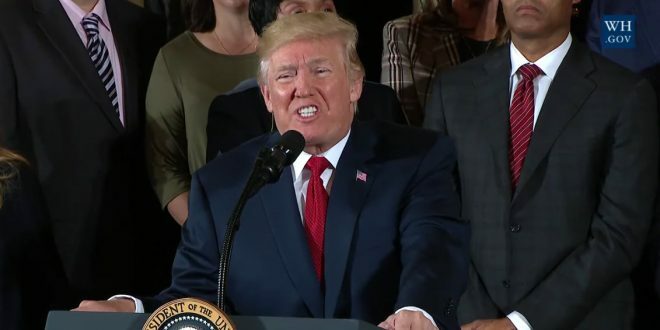 LIVE VIDEO: Trump Declares Opioid Emergency - Joe.My.God. President Trump on Thursday will announce he is directing his Department of Health and Human Services to declare the opioid crisis a public health emergency, senior administration officials said, taking long-anticipated action to address a rapidly escalating epidemic of drug use in the United States. The move falls short of Mr. Trump’s sweeping promise to declare a national emergency on opioids, which would have triggered the rapid allocation of federal funding to address the issue, and does not on its own release any money to deal with the drug abuse that claimed more than 59,000 lives in 2016. But it would allow some grant money to be used for a broad array of efforts to combat opioid abuse, and would ease certain laws and regulations to address it. Mr. Trump’s directive, to be announced in an address at the White House on Thursday afternoon before he signs a presidential memorandum on opioids, would fulfill a vow that he made when he assumed office to make tackling opioid abuse one of his top priorities. But he has so far taken limited action to carry that out.